I wouldn't use the data dump for this; there are easier ways to retrieve this information rather than having to parse a couple of GBs of XML. 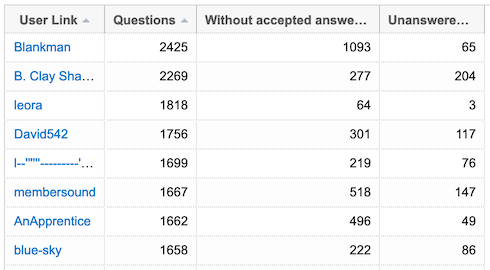 Enter the Stack Exchange Data Explorer. You can try asking for more than 100 hits, but it might run out of resources and fail if you do so. Maybe you want to exclude closed questions? If so, or you want to make other changes, feel free to fork the query. If you need some help with SQL and/or the structure of the database, check out the awesome tutorial and the chatroom. Note that SEDE is updated once a week, on Sunday morning. Not the answer you're looking for? Browse other questions tagged support questions data-explorer users data-dump .